Covering the important task of the scale-up of processes from the laboratory to the production scale, this easily comprehensible and transparent book is divided into two sections. The first part details the theoretical principles, introducing the subject for readers without a profound prior knowledge of mathematics. It discusses the fundamentals of dimensional analysis, the treatment of temperature-dependent and rheological material values and scale-up where model systems or not available or only partly similar. All this is illustrated by 20 real-world examples, while 25 exercises plus solutions new to this edition practice and monitor learning. The second part presents the individual basic operations and covers the fields of mechanical, thermal, and chemical process engineering with respect to dimensional analysis and scale-up. The rules for scale-up are given and discussed for each operation. Other additions to this second edition are dimensional analysis of pelleting processes, and a historical overview of dimensional analysis and modeling, while all the chapters have been updated to take the latest literature into account. Written by a specialist with more than 40 years of experience in the industry, this book is specifically aimed at students as well as practicing engineers, chemists and process engineers already working in the field. Prof. Dr.-Ing. Marko Zlokarnik studied chemical technology and obtained his Ph.D. in process engineering from RWTH Aachen University and was active in process engineering R & D at Bayer AG, Leverkusen, for 35 years. His work involved reaction apparatus design for chemical production facilities, which, apart from elucidation of reaction kinetics, also brought fundamental work on mixing technology and modelling with it. In the 70s, he developed an especially efficient biological wastewater treatment (Bayer tower biology with flotative removal of activated sludge). From 1970 to 1990, he taught similarity theory at the Technical University of Clausthal-Zellerfeld, then held the Bayer Foundation Chair of Chemical Technology at the University of Cologne. He served as chairman of the VDI-GVC committee on biological process engineering from 1979 to 1988, and in the course of his career has published 60 books, 20 patents, and 5 books, receiving the Otto Bayer Gold Medal and the VDI Honorary Medal for his work. "... This book presents the dimensional analysis as the only secure foundation for scale-up in such a way that it can be immediately and easily understood, even without a mathematical background. 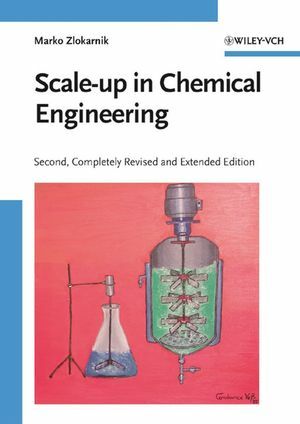 ..."
"...Written by an expert with more than 40 years of experience in the industry, this book is specifically aimed at students as well as practicing enginerrs, chemists and process engineers already working in the field."